We’re fully into the Christmas season and it’s easy to naturally let our hearts turn to the children, specifically to the children in need. There are lots of ways to get involved, lots of good ways to help and to support. There are coats for kids and angel trees and toys for tots and a lot more. But I’m thinking this morning about the things that lots of kids need today. They need love and they need the security of knowing they belong. They need to be accepted for who they are…heck, they need to know who they are! In these days of virtual connection kids need real connections. They need positive role models and unconditional love. They need days where they’ve had so much fun they fall into sleep even before they fall into bed. They need to be tucked in at night with a song and a prayer and a hug, to sleep the sleep of a child who knows she’s loved. Sadly in our world today, many kids don’t automatically get this at home. They don’t get it at school. They don’t get it on Facebook or X-Box. As good as the church is, they don’t get it all there either. But it occurs to me this morning that there is a place where they get all these things. When a kid spends a week at camp, he gets these things. Camp is a place where kids can play and have fun, sure. But, you see, fun is oftentimes the very thing that opens their heart to so much more. Camp is a place where a kid can explore and discover and reveal the person she is to become…she can try on her future self to see how it’s going to fit. He can try the new thing, the risky thing…and succeed and feel the confidence it brings as his new self swells with new found pride. And if that new thing fails, he’s in a safe place where failure isn’t measured or seen as a bad thing. Failure just means it didn’t work and it’s time to try it again. A kid at camp is an accepted kid who is loved and included. A kid at camp is surrounded by positive influence, by older mentors who care and who have sacrificed to be doing what they are doing. Because…they went to camp and that’s where they’ve discovered who they are too. I’ve made camp my life’s work and know a lot of good ones. But I know one great one. Shepherd’s Fold Ranch is a place called home and has been a place called home for decades. I know I’m prejudiced (I grew up at SFR) but that doesn’t mean I’m wrong. This Christmas, I’m going to give a couple of kids the gift of love and acceptance, of belonging and connection, of security and yes, fun. I could buy a coat to warm them outside but I’d rather give them something that will warm them inside. 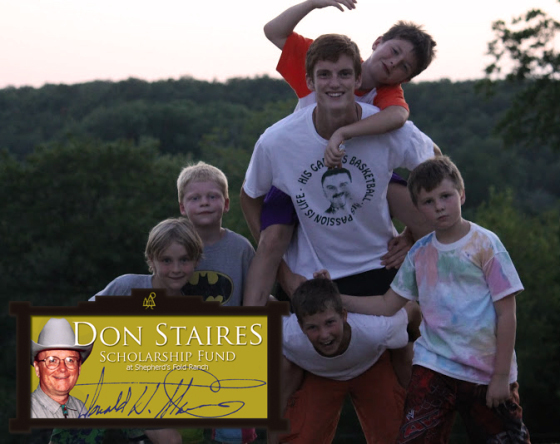 I’m giving to the Shepherd’s Fold Don Staires Scholarship Fund. Will you join me? « So what’s the big deal about being thankful?